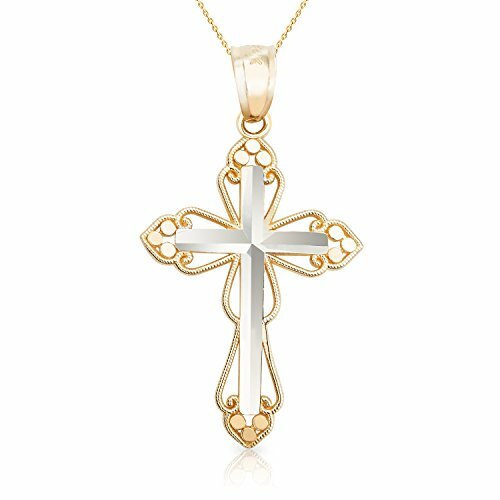 Delicate Filigree 14K White and Yellow Cross Pendant Necklace Shine with the light of your faith in this beautiful Cross Pendant Necklace from Jewel Connection. 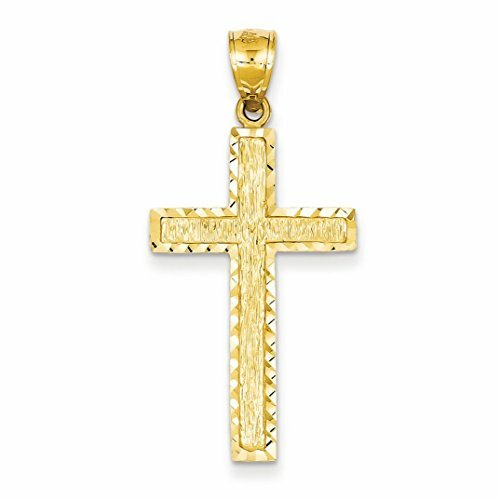 Gorgeous millgrain filigree in yellow gold surrounds a diamond cut cross. 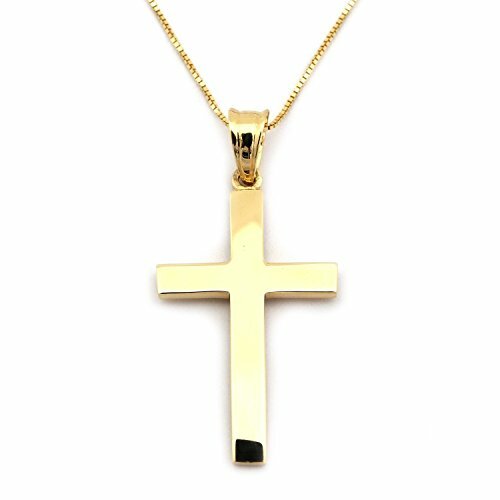 Delivered in a beautiful gift box, this pendant necklace makes the perfect gift for any occasion Why you should trust Jewel Connection's 14K White and Yellow Gold Cross Pendant Necklace: BEST VALUE NECKLACE - made of 100% solid 14K Yellow and White Gold DURABLE - guaranteed to stand up to everyday use without wearing out! SUPERIOR QUALITY - stylish and well polished. Our jewelry does not look cheap or fake like others. PUTS A SMILE ON HER FACE - makes the best all occasion gift item to that special woman on her birthday, valentine, anniversary, Christmas, mother's day, etc. We take pride in the quality and craftsmanship of our jewelry. All purchases come with a 100% satisfaction guarantee. If for any reason you are not completely pleased with your purchase, simply return within 30 days for a full refund or replacement. Retailer Information Jewel Connection is a Los Angeles based luxury jewelry retailer focused on affordable quality and unmistakable style. 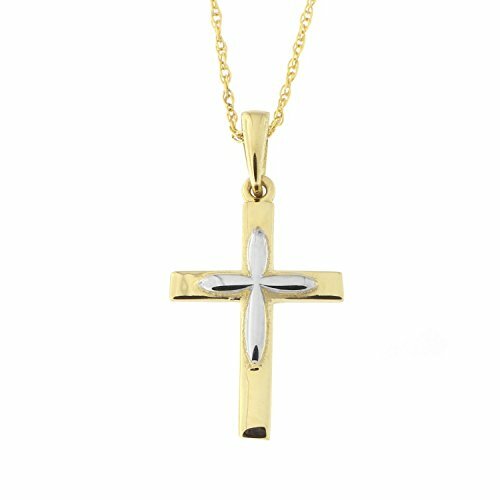 Beauniq 14k Yellow and White Gold Layered Cross Pendant Necklace, 16"
This necklace is made of solid 14k gold (not plated, bonded or filled) and stamped "14K " (585). The necklace is a delicate and feminine thin rope chain with a spring ring clasp. This necklace is simply elegant, coordinating with every outfit and suitable for every occasion.The pendant measures 10mm (0.39 in) x 15mm (0.59 in), the weight of the pendant is 0.5g, the weight of the 18" necklace is 1.1g, the chain is 0.8mm thick and either 13, 15, 16, 18, 20, or 22 inches long.About GoldPure gold (24 karat) is a very soft metal. In order to make it into durable jewelry you can wear everyday, it is mixed with other metals to add strength. The most popular alloy of gold is 14K gold, which is 58.5% pure gold and 41.5% other metals like silver and copper. Adding other metals to gold also allows us to make beautiful gold variations like white and rose gold.Gold Jewelry CareTo clean your gold jewelry, soak it in a bowl of mild liquid detergent and lukewarm water. Then rinse with water and dry with a soft cloth. Be careful not to bend any prongs while cleaning, as this could loosen stones from their settings. We recommend storing your gold jewelry individually wrapped in soft cloth to protect it from being scratched. 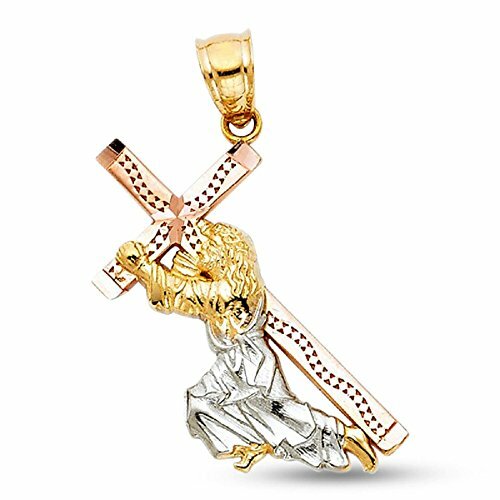 Beauniq 14k Yellow Gold Large Polished Cross Pendant Necklace, 17"
High quality fine fashion jewelry ring. 100% genuine solid 14k gold. 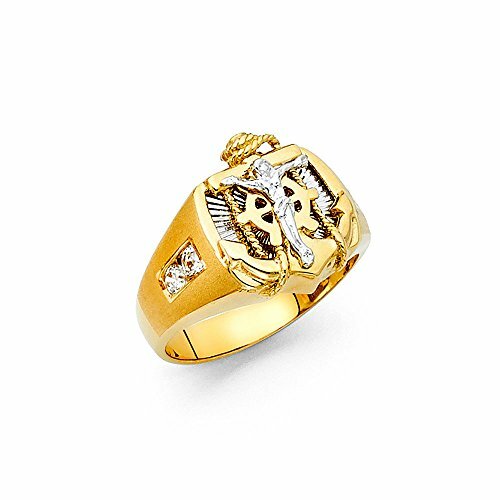 Great Mens gift for any occasion, especially as Anniversary ring, Promise ring, or Right Hand ring. 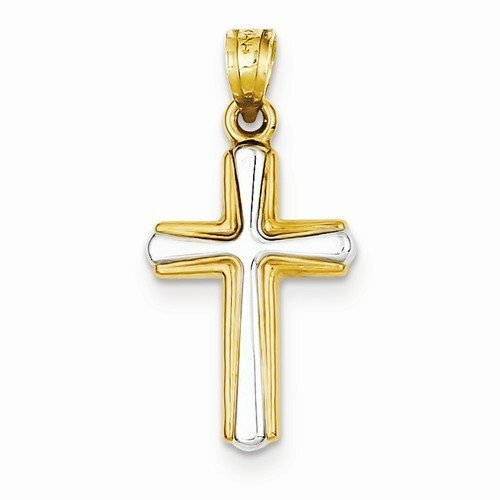 Mariner Crucifix Ring Solid 14k White Yellow Gold Anchor Cross Band CZ Religious Fancy Two Tone, Size 9. 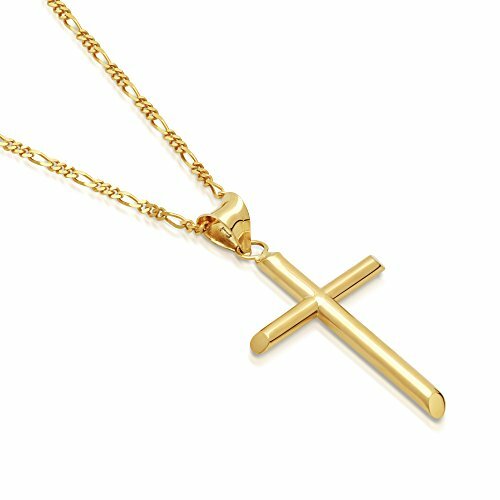 DTLA Solid 14K Gold Figaro Chain Cross Pendant Necklace - 18"
Cross pendant made from solid 14K yellow gold. Figaro Chain is also made from solid 14K yellow gold and is 1.6mm wide. Pendant height is 30mm and width is 15.57mm. Comes in lovely gift box. 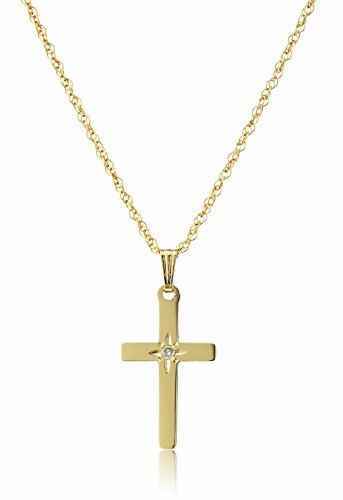 14k Yellow Gold Solid Diamond-Accented Cross Pendant Necklace, 18"